Are surfing aerials and caber tossing the same? No. Not really. Well, maybe. Here are some thoughts from the Gold Coast, with Jordy Smith, Caroline Marks and the WSL, writes Spike. This piece is not about caber tossing, although those logs do get a little bit of air, and it seems to be a major focus in surfing to get some too. How do you score caber tossing? Quite differently from surfing I would think. Or not? Ferreira, who won the Red Bull Airborne specialty event earlier in the event, just won the Quiksilver Pro Gold Coast using the air game quite a lot. He is the current poster boy for the air game, the new old game in town, but is it cool to watch people hop and bounce off waves and contort themselves into ugly little balls? 'It was so kak to watch! 'I guess to non-surfers it looks cool, like wake boarding might, or snow boarding, BMX, DH, Enduro, slopestyle something, bungee jumping, and tree flicking. Okay that's not a thing, but caber tossing is. Not sure how cool chucking a log weighing 175 pounds is, but many Scottish people would disagree. Needless to say, some people were irritated at watching all the bounciness we had to endure this weekend. Seasoned surf hack Craig Jarvis was one of them. "It was so kak to watch! I hated the contest last night. Italo's surfing was ugly." It seemed a bit harsh, I thought, but he elaborated. "You know, six years ago I was in Australia and they went to Kirra and there was that final with Slater and Parko. Slater dropped in on Parko, and Parko gave the middle finger in the tube as he watched Kelly about to take the drop in front of him." It was pure surfing drama. 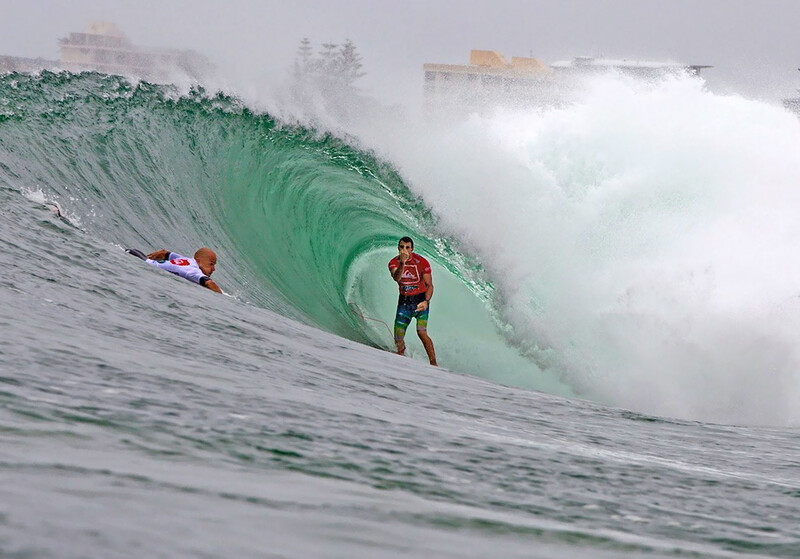 Slater had priority over Parko, who needed a perfect ten to overtake Slater with the heat counting down. Parko pulled into a long barrelling wave. Locked in the tube, it seemed to be running away from him. Slater dropped in down the line. He was well within his rights in terms of the rules but maybe not the unwritten rules. The wave shut down on Parko. Many people said it would have anyway, but it was in that moment, according to Jarvi, came the reason "why that event was so kiff. I loved that contest, but I hated the contest last night. But then I realised, it's actually about the waves. When the waves are 6ft and barreling, it's cool Jordy's powerful rail to rail surfing still counts for some scores, sometimesto see aerials because we're also seeing barrels and carves. When aerials are combined with other moves as dictated by the wave, it's the most pleasing. But when its 2ft and the only thing you can do to impress are those nose-to-tail shoveits and varials and weird slidy things?" he asked. Well, the answer lies in what the judges think. And therein lies the rub. Should airs take over from the other moves when the waves are crap? Anyhoo, what was cool to see was that Jordy's powerful rail to rail surfing still counts for some scores, sometimes, and that he starts the year strong, now sitting at #3. The ever-dwindling legion of jaded Saffa fans see a glimmer of hope. It was good for Jordy to get one over the man who beat him in the semis of the 2018 Billabong Pipe Masters - always a nice psychological boost at the beginning of a new season. Medina was talking about "coming in super focused" but was not counting against the savvy Smith who gets better and more contest aware and more mentally sharp as the years ago by. Is it okay to say this is Jordy's year? Shhhh man! Stop it. 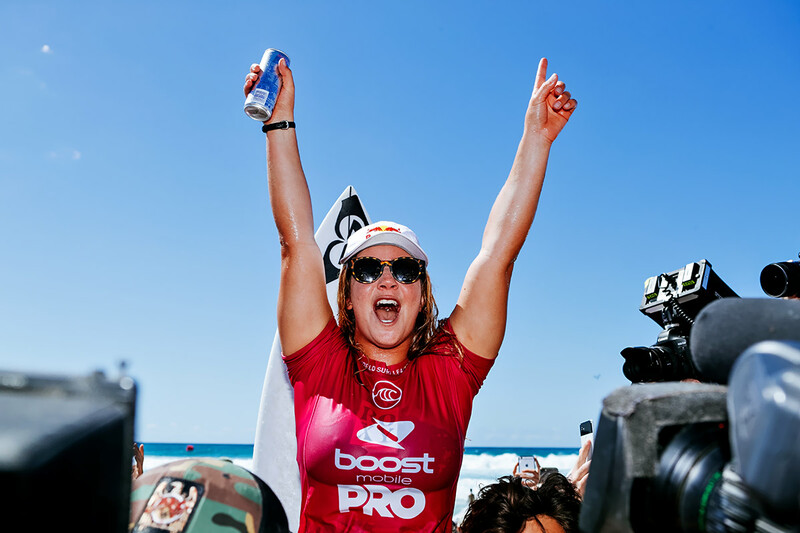 The other major take-away was that a 17-year-old girl, Caroline Marks, just won her first event on the women's CT, the Boost Mobile Pro Gold Coast, and that finally after all of our (the 'media') gnashing and wailing of teeth, the WSL finally awarded equal prize money to the men and women. "I can’t believe it. I’m speechless," Marks said (her win, not the equal pay). "I was actually laughing because the first time I came to this event I was in the Trials and I just lost in the first heat every single time, so to now win the event is amazing. This has been the best event and best week of my life. There’s still a lot of work to do for the rest of the year, but I’m definitely going to enjoy this moment." En route to her win, Marks defeated seven-time WSL Champion Stephanie Gilmore (AUS) in the Quarterfinals, Malia Manuel (HAW) in the semi-finals, and three-time WSL Champion Carissa Moore (HAW) in the final. Moore - a two-time Gold Coast event winner - was on fire all week but in the final struggled to find the score to earn the 22nd win of her career. One can already sense that 2019 it going to be a huge year in surfing. For a start, it marks (sorry) the first opportunity for the world's best surfers to qualify for the Olympic Games Tokyo 2020, where surfing will make its debut. The Championship Tour rankings at the end of this season will determine 18 of the 40 available places (10 men and 8 women). What's also cool, and smart, (and reduces the workload for hacks like me), is that not only have they awarded equal pay, the World Surf League sends out joint press releases and photos of the men and women. So we segue back to the men, with Ferreira, 24, on top of the world literally after a come-from-behind and somewhat and slightly controversial victory over Californian Kolohe Andino (USA), with some saying Ferriera was over-scored. This puts us back to the debate about how you score aerials. Speed, Power and Flow, with variety? Repeated backside, frontside, kickflippy, backside slidy things, with those flipside bunny hops are a bit repetitive, and lack variety. Or not? Perhaps the observation is moot. In good waves, the complaint doesn't hold water. Nature provides the variety. However, the other clincher this weekend, according to Jarvi, is that Durranbah, the backup site that sits in Queensland, was firing, but the organisers pulled the surfers back to Snapper, which lies in New South Wales, and promptly put the event on hold because of a lack of waves, and then called it off when the wind came up. "It was the best day of the contest at Durranbah but they didn't run it," said Jarvi, who believes it's all about competitive politics between Queensland and NSW. "The border between the two states is literally between Snapper and Durranbah. It even marks the switch to a new time zone." The infrastructure and traders and business were centered at the prime location, so it would appear the surfers were moved from the good surf to the non-surf because of political pressure to run it where the money and permissions were. It's going to be an exciting year with equal pay, the Olympics looming, and the tour evolving so fast. The WSL has gone out of its way to pander to the need for gender parity. All good. They've boosted the longboarding tour substantially. That's great. However, the Big Wave Tour remains a bit thin, with several top spots not in the mix, and scarcity in the two tours - three for the men, two for the women. While there is a lot of good going on in surfing at the moment, it remains a top priority for the WSL to stay true to the surfers, and to the spectacle. For highlights from the Quiksilver Pro and Boost Mobile Pro Gold Coast, visit www.WorldSurfLeague.com. Totally agree with the aerial comments and views here. I love seeing carves, tubes, hacks and airs being an extended part of a move. Ferreira absolutely rips and the best surfing I have seen in a comp was when he won at Keramas. Total vert power on every wave and a huge air to finish it off. But that funny, spinning 360, JJF has this little, flick air reverse. It's getting very lame and boring!! !